Years ago when I started my public relations and marketing career, I had a boss who told me to “quantify everything, because the floor is littered with people who never tracked their marketing projects.” It was long before digital PR, but that sage advice still holds true today. You must carefully track your digital PR programs if you want to know whether your organic content marketing efforts are working to increase sales, and if they are expanding your online and offline presence. And from a purely selfish standpoint, tracking your positive quantitative results will demonstrate tangible outcomes to the company’s management, helping to ensure your marketing programs will continue. When tracking my social media efforts, I like to focus on three key quantitative factors: Reach, Impressions, and Engagement. Each one supports the others, as they are related to build your online presence. Remember, social media is about creating a conversation between you and the user, and you’re going to miss the mark if you don’t study your pages or ignore account analytics. Reach is the number of unique sets of eyeballs looking at your posts. Even if one person views your post 20 times, it counts as one reach. Often, reach is dismissed as a vanity metric because putting a conversion metric against it can be elusive. With that said, I think reach measurement should be taken seriously because platforms such as Facebook and Instagram use algorithm-based feeds, and even if you have a large audience, not everyone will see your post if you’re missing the mark. Reach tells you, from an organic standpoint, the popularity of your post and if it’s getting through to a wider audience. In other words, the higher your reach, the more you know your content is of interest to your audience, which gives you great insight. Because not every one of your posts will receive the same amount of success, reach helps you understand what your audience likes—content-wise—and why some posts will outperform others. Although you should carefully study the reach of each post on all the social media network websites you’re using, it’s especially important for Instagram in order to gauge whether your content marketing program is working as planned. When it comes to Instagram, I like averaging reach over a time span which, depending on your content calendar and how often you post, could be weekly, bi-weekly or monthly. I believe you can’t find a better reason than reach to avoid posting content simply because it’s the end of the day and you suddenly realize it’s time to update your feed. Don’t post just anything you happen to have at your fingertips because, once again, social websites use algorithmic formulas for organic reach based on the relationship you’ve created with your audience. In order to build organic reach for future posts, your previously published content has had to make an authentic connection to your audience via impressions, engagement, and just plain interest. What Are Social Media Impressions? Although reach and impressions often are used interchangeably in casual conversation, they give you very different—and important—insights. As mentioned, reach is unique eyeballs looking at your post, thus, each person is counted once no matter how many times the user viewed the post. Impressions, however, is the number of times your post has been seen by anyone and everyone. And so, if Instagram user Joe Smith views your image 20 times, that would be one reach and 20 impressions. As you can see, impressions is an important insight because it can confirm that your social media marketing campaign is on track and your followers are finding value with the content you’re posting. Think about it. If your audience is looking at your post more than once, it has caught their eye and, most important, their attention. In many ways, you’ve answered the difficult content marketing question of what should be posted to a timeline or feed. Your audience feels you are posting valuable content that is visually informative, educational, and entertaining. As with measuring reach, you will want to look carefully at the impressions numbers for individual posts, as well as averaging reach over reasonable time spans. A lot of marketers focus only on engagement—Likes, Shares, and Comments—and give just a cursory look at reach and impressions, which can lead to a strategic stumble with your social media marketing campaign. Think about it: People will engage with you only if they can see the posts and find them interesting. In other words, high reach and impressions metrics should ultimately lead to strong social media engagement numbers. If you’re creating content that has reach, the social network sites’ algorithm-based formulas suggest that unique followers want to see your posts, and these followers are returning to see your content numerous times or have stopped on their social media travels long enough to give your post careful consideration to either Like, Share, or Comment. Engagement tells you the actionable interaction between your brand and its audiences in the way of Likes, Shares, and Comments. 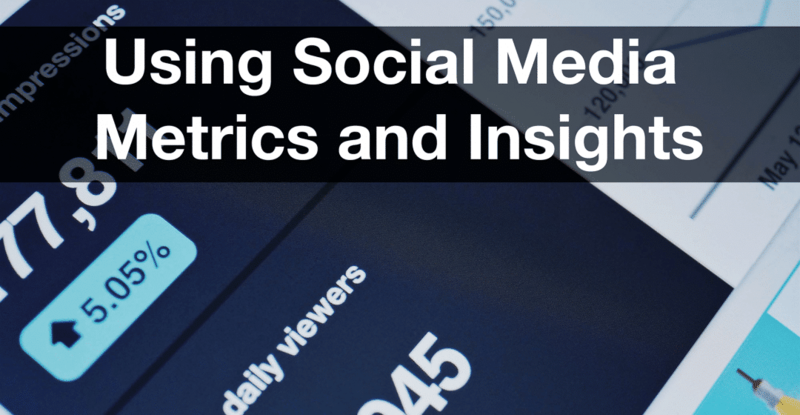 In many ways, it’s the meat and potatoes of social media metrics because it tells you the authenticcommunications between you and your followers and can be the sustaining factor or the start of a long-term relationship with your followers. When it comes to Comments, you want to be an active participant and to keep the conversation going as long as possible, demonstrating to your followers that you’re engaged and involved. Always answer questions and, most important, ask questions to build a relationship with your audience. “What’s your favorite,” “How often do you visit,” or simply, “Thanks for the good words!” will increase your engagement for upcoming posts. Most important, responding to comments will increase profile views, click-throughs to your websites, and conversions, such as followers becoming customers. Also be sure to study which posts are being Shared, because Shared posts increase the visibility of your content, which in turn increases the audience base and the probability of more people seeing your posts and, of course, will increase your reach. So as you see, reach, impressions, and engagement must be working in sync, and the metrics need to be analyzed together, to ensure your organic content marketing campaign is on track. With that said, depending on the campaign, I always make sure there is a conversion action waiting on the website for click-through followers, such as an e-newsletter subscription form to capture pertinent contact information. Looking for more insights to help make your social media marketing campaigns successful? Check out our recent blog post on creating a hashtag strategy for Instagram. "Over the past 10 years Lee Esposito Associates has provided SmithFoods with excellent public relations support. From trade and consumer connections to crisis management, LEA has the expertise to deliver relevant content to the right people at the right time through a variety of traditional and new media channels."